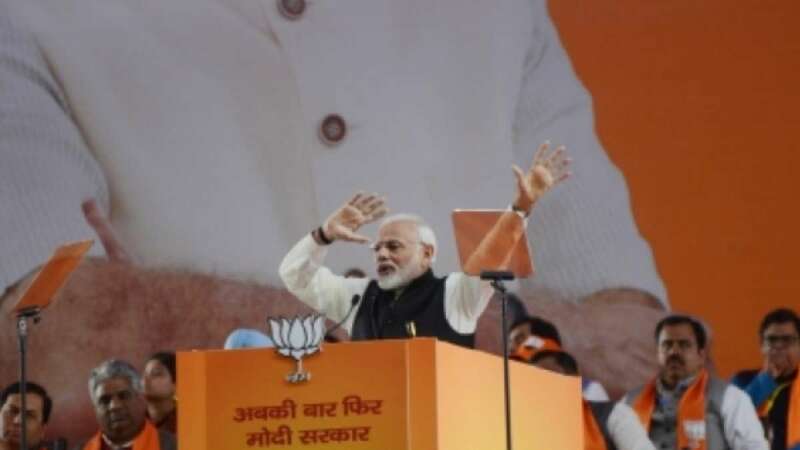 New Delhi : Prime Minister Narendra Modi on Saturday made a strong pitch for his re-election in the next Lok Sabha elections as he launched a scathing attack on the Congress saying it had pushed the country into darkness, bled banks and had created road blocks to an early judicial solution to the Ayodhya dispute. "But they are scared of their misdeeds. You have faith on institutions. They do not have faith in the CBI, CAG. Can we hand over the country to them. We have faith in the constitution, they have on the sultanate," he said. "We are `naamdars', how can we go, how can we be asked questions. The fact is that they have problem with truth. What are they hiding, we do not know. People on bail do not respect institutions, what respect they will give to the country. They have faith on 'rajshahi' (feudalism) and we on 'lokshahi' (democracy)," he said. "Do people want a `sevak' who provokes family members, steals from the house, distributes the goodies among his family members and talks ill of the family with neighbours, goes on long leave or a sevak who works day and night, works more than the owners of the house and always thinks of their welfare. Modi said the Congress had bled the banks as two processes prevailed during its rule for availing - "common process" and "Congress process." He said there were two process of getting loan - "common process and Congress process". "In the Congress process, loans were given on a phone call of `naamdar', no question was asked and more loans were sanctioned to pay the previous loan and then the whole amount was gobbled up. Referring to the issue of the Ram Temple at Ayodhya, he said Congress sought to create "obstacles" in the judicial process through a partyman who is a lawyer. Modi said he was being abused and conspiracies were being hatched through an eco system linked to the Congress.